Ganzhou, China (January 23, 2018) – Christie, a leader in creating and delivering the world’s best visual and audio experiences, is pleased to announce that Yashan International Resort Hotel has become the first luxury guesthouse in China to be equipped with Christie’s leading-edge cinema projection and audio solutions. 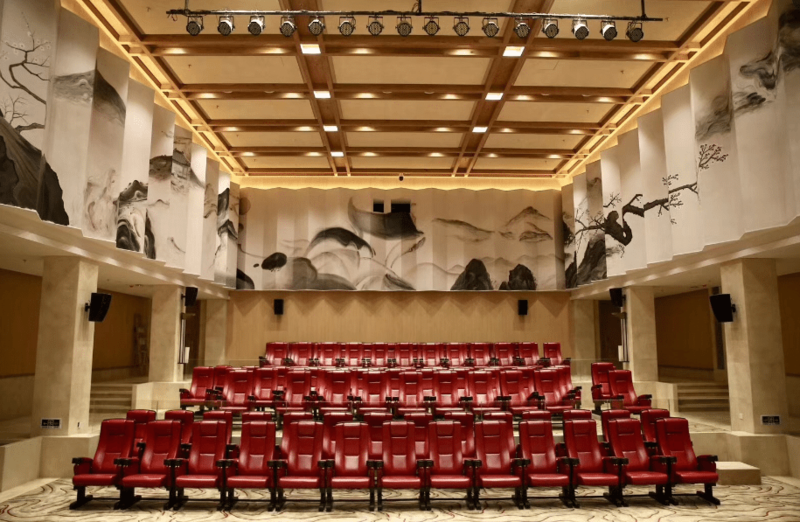 Located in the picturesque district of Yashan in Ganzhou, Jiangxi Province, the five-star resort hotel has installed a Christie CP2308 digital cinema projector and innovative Christie Vive Audio system in its in-house VIP Theater to provide guests with the ultimate visual and audio experience, one normally associated with premium cinemas. Tastefully designed with classic Chinese watercolor painting motifs on its walls, the VIP Theater features an 11-meter wide screen and is furnished with 100 extremely comfortable seats, similar to those found in full-fledged upscale cinema auditoriums. The system was designed by Christie’s trusted partner, Sentiment-Hifi, while Nanjing-based Dowin Audio conducted general contracting work. Through the joint efforts of the two companies, the project was successfully executed and completed to the satisfaction of the customer. The theater has been operational since early January, and is currently one of the most popular rendezvous points for hotel guests. A high-value digital cinema projector, the CP2308 is capable of projecting 9,000 DCI lumens and comes with an integrated DCI playback engine, built-in automation features, and Christie Series 3 electronics, which features a streamlined UX-inspired interface to simplify the playback, scheduling and management of cinema content. Perfect for smaller screens, the CP2308 is capable of displaying premium 2D/3D HFR feature film and alternative content in its original format, as well as realistic colors and gradients for an immersive experience audiences notice. The Christie Vive Audio components installed include the LA1 line array loudspeakers, LS3S line array surround loudspeakers, S115 and S218 subwoofers for bass management, as well as CDA2 and CDA5 Class D amplifiers. The end result is highly immersive cinema sound known for delivering exceptional power and performance. By combining the superior sound quality of ribbon driver technology with the precise directional performance of line array loudspeaker design, Christie Vive Audio enables the accurate reproduction of today’s digital cinema audio formats. So far, Christie’s cinema audio solution has been embraced by close to 600 theaters around the world. These include Wanda Cinema Line, MZC Quanjing Cinema in Baotou, Inner Mongolia, and Xinshidai MZC Cinema in Benxi, Liaoning Province.